eBay is adding Google Pay to Managed Payments, which is currently optional for sellers as the marketplace transitions away from PayPal powering its payment processing. eBay already offers Apple Pay for mobile payments through Managed Payments. While eventually Managed Payments will be mandatory, some sellers are resisting opting in until eBay adds PayPal as a payment method, which it has promised to do by July 2019. Currently only available in the US, eBay is expected to add another geography to the program in July. 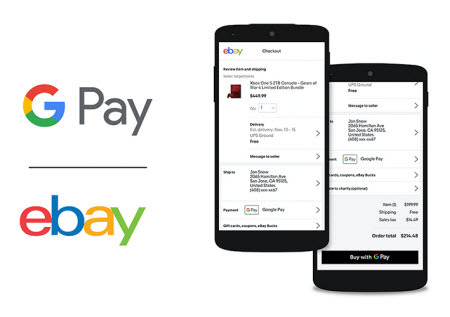 eBay is introducing Google Pay to its suite of payment options to further increase customer choice in its new managed payments experience. The company announced last year that it will intermediate end-to-end payments on its marketplace to further simplify and improve the customer experience and expects to manage a majority of the payments on its platform in 2021. Buyer: Far too late, don’t care anymore. Seller: Would’ve liked to have this option, still not offered. So, when WE do our own payments, we only get to use paypal, when Ebay decides they will do it for us, all of a sudden, the options are limitless. To the abyss with Ebay and Wenig and all he suits there. I will not be allowing Ebay to accept payments for me, it will be the end of what little is left. I have moved most of my stuff awhile ago to other venues. Ebay is dead in the water after this move.